The industrial team that aims to make an astronaut launcher by marrying parts of the US space shuttle and Europe's Ariane rocket says it now has a complete system. Known as Liberty , the launcher would be sold to Nasa to take its crews to the International Space Station (ISS). Utah-based Alliant Techsystems (ATK), whose side boosters got the shuttle off the pad, is leading the project. 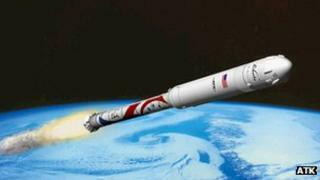 The company expects Liberty to launch on its first manned mission in 2015. "Today, we don't have the ability to launch astronauts from the United States, so showing up with this service quickly is very important," said ATK's Kent Rominger. "Twenty-fifteen is when I'm going to fly crew. We have our first crew picked out [and] our first test commander," he told reporters. The Liberty concept calls for the new vehicle to be based on a slightly longer version of the solid-fuelled shuttle booster. This would form the first stage of the rocket. The top half would use the liquid-fuelled core-stage technology and engine that powers Europe's Ariane 5. Ariane is currently the world's dominant launcher of large telecommunications satellites, but was originally designed in the 1980s as a means to put a European crew shuttle in orbit. Following the retirement of the shuttle last year, Nasa is looking for a new American system to take its astronauts into space. At the moment, the agency has to buy rides from the Russians on Soyuz rockets, but it is hoping to spur a new commercial market in space transportation within the US. Several companies - ATK included - are now in competition to provide those crew-carrier services, with Nasa expected shortly to select perhaps just two systems to provide support through to final development. ATK hopes the heritage of Liberty's systems, which have benefited from billions of dollars of taxpayer investment down the years, will prove most attractive to Nasa. The new elements announced on Thursday are a case in point. The abort system Liberty will use was developed as a technology exercise inside Nasa and has already been tested. And the service, or propulsion, module for the capsule is based on technologies already developed for Nasa's own Orion deep-space crew craft. The Lockheed Martin company, which has been doing the service module work, is now a member of the Liberty team. Of interest to European observers is the role of Astrium, the prime contractor on the Ariane rocket . Europe's biggest space company is working out the modifications that will be needed on an Ariane core stage to make it work within the Liberty concept. This involves some structural alterations to make sure the stage can handle the loads it will experience as it is pushed from underneath by ATK's booster. Ariane's Vulcain engine, too, will need a re-assessment to understand how it will perform when ignited in the high atmosphere. Normally Vulcains are ignited on the ground. "We're interested in Liberty because it's a new market for us, and a chance to enter into a US opportunity," said Alain Charmeau, chief executive of Astrium Space Transportation. "We're already the leader in the commercial satellite market, but with Liberty we would be entering a new programme that has, as a first priority, to serve US government requirements. That's new for us," he told BBC News. Liberty operations call for the Ariane "second stage" to be built in Europe and then shipped to Florida for integration into the finished vehicle at the Kennedy Space Center. However, if Liberty becomes a big success, Astrium may replicate its Ariane production facilities in the US. "We hope that the market will be big enough so that we will have to duplicate production tools, and if that happens we will open the debate about whether we do that in Europe or in the US, and whether it is just for final assembly or includes the components as well," explained Mr Charmeau. ATK has an unfunded Space Act Agreement with Nasa, presently. This means it benefits from the agency's advice and expertise, but must develop the Liberty concept from its own funds. Kent Rominger confirmed that the 2015 target for a first crewed launch was dependent on Nasa choosing Liberty as one of its preferred systems, in which case it would then receive financial support. However, even if Nasa overlooked Liberty, Mr Rominger said, ATK would continue to work on bringing the Liberty rocket to market.